Five Arab countries have been named among the top 10 most corrupt countries, according to Transparency International's newly released annual Corruption Perceptions Index. Crowdvoice is a platform that “works to provide first-hand reports, occasionally coupled with the top mainstream media coverage.” By curating and putting to the forefront the sound bytes of these working to change the world, Crowdvoice compiles a wide range of resources in a meaningful whole thus enabling access to the complexity of stories behind protests. The latest such compilation is on protests in Iraq, spanning 10 years of turmoil. The resource is extremely valuable for anyone trying to make sense of the recent dramatic surge of violence, having left almost 1,000 dead for only the month of September 2013. Screenshot of ‘Protests in Iraq’ timeline on Crowdvoice. Iraqi security forces carried out a “massacre” of 52 unarmed Iranian dissidents early Sunday at their camp north of Baghdad,Mujahedeen-e-Khalq, the Iranian exiles said. Netizens in Balatarin, a popular link sharing site, shared several photos, films and posts regarding this attack. While the dishonest and the stupid are attempting to railroad everyone into military endeavours devoid of public benefit, let us remember that France stood out of the Iraq war because it had independent orbital imaging capabilities showing that the WMD claims were nonsense... 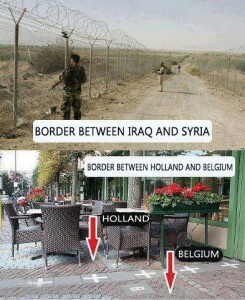 Meanwhile, the USA took for a ride all the blind ones who had decided that US imagery was cheaper and good enough. Ninety-one people (and counting) have been killed and 323 injured in a wave of 17 different bomb explosions across Iraq tonight. No words.. Death toll in #Iraq now at 91.. 323 injured..
"In my country, Eid has died." You would think that car bombs after car bombs would force Iraqi security officials to replace the magic wands. When is enough enough?
. @AFP tracking car bombs in Husseiniyah, Shaab, Kadhimiyah, Baghdad Jadidah, Amil, Dura, Saidiyah and Jisr al-Diyala areas of Baghdad. The mad sectarian killing spree continues in #Iraq and not a single Arab leader speaks out against it. Disgusting. Yes I'm flooding your timeline with #Iraq news, because no one else will. If you're not happy with it unfollow & bear it in your conscience. Last week, US Army soldier and whistleblower Bradley Manning took the stand in a military hearing to explain, in his own words, why he leaked thousands of sensitive military documents to the website WikiLeaks. Journalist Alexa O’Brien’s unofficial transcript of the testimony is here. Manning told the court that he decided to leak these documents to the media because they left him deeply concerned about American military activities in the wars in Iraq and Afghanistan. At the hearing, Manning’s defense team submitted a guilty plea for ten of the charges against him, including several minor charges related to accessing information. For those ten charges, Manning could face a maximum of 20 years in prison. Despite his plea and testimony, the US government is continuing to pursue all 22 original charges against Manning. The most serious among them, ‘aiding the enemy,’ carries maximum penalties of life in prison or even the death penalty, though prosecutors have stated they will not ask for a death sentence in Manning’s case. “The most alarming aspect of the video to me, however, was the seemly delightful bloodlust they [the U.S. soldiers] appeared to have. They dehumanized the individuals they were engaging and seemed to not value human life by referring to them as quote “dead bastards” unquote and congratulating each other on the ability to kill in large numbers. At one point in the video there is an individual on the ground attempting to crawl to safety. The individual is seriously wounded. Instead of calling for medical attention to the location, one of the aerial weapons team crew members verbally asks for the wounded person to pick up a weapon so that he can have a reason to engage. For me, this seems similar to a child torturing ants with a magnifying glass. I believe that if the general public, especially the American public, had access to the information…this could spark a domestic debate on the role of the military and our foreign policy in general as well as it related to Iraq and Afghanistan…I also believed the detailed analysis of the data over a long period of time by different sectors of society might cause society to reevaluate the need or even the desire to even to engage in counterterrorism and counterinsurgency operations that ignore the complex dynamics of the people living in the affected environment everyday. Although the information had not yet been published by the WLO, I felt this sense of relief by them having it. I felt I had accomplished something that allowed me to have a clear conscience based upon what I had seen and read about and knew were happening in both Iraq and Afghanistan everyday. A three-time Nobel Peace Prize nominee, Manning has been imprisoned for nearly three years awaiting the beginning of his military trial. He has appeared in military court for various pre-trial hearings in which key components of his case and how it will be tried have been determined. These include facts about what witnesses will be permitted to testify, what evidence may be presented, and what arguments will be considered by the court. A pivotal question in his case is whether or not United States's national security was harmed by WikiLeaks’ publication of the documents that Manning leaked. After a legal battle lasting several months, Manning's defense team was able to obtain government research reports on this question. However, the judge in Manning's case then ruled that whether national security was harmed by the leaks would not be considered a relevant factor in determining Manning’s guilt. Unfortunately, officials have placed many limitations on public access to these hearings. The military refuses to provide an official transcript of the hearings to the public, and live coverage of the hearings (through Twitter or live blogging, for example) is prohibited. This is particularly troublesome because these proceedings, like military trials in general, are supposed to be accessible to the public. Both the substance of Manning's case in particular, and the nature in which certain judicial proceedings around his case have been kept private, raise important questions about access to information and government transparency and accountability in the United States. These questions and the emerging role of Internet entities like WikiLeaks in providing open access to government documents are issues of significant concern for the Global Voices Advocacy community. Manning is scheduled to begin his trial on June 3, 2013. Activist organizations worldwide are planning events to show support for Manning on June 1, 2013. 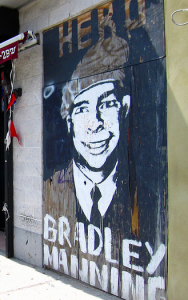 Visit www.bradleymanning.org to learn more. M. Lynx Qualey, blogger, who is interested in Arab and Arabic literature, wrote a series of posts introducing acclaimed Arab poets, novelists, and short-story writers’ favorite Arab reads of 2012. She started with a list of nonfiction books, then followed by a list for poetry [En] and fiction [En]. Bahraini Twitter users took a break from politics and had some fun this morning on the microblogging social network. Artist Anas Al Shaikh read a news article which said that an Iraqi woman had killed herself in protest against her husband watching dubbed Turkish soap operas. Turkish soap operas have replaced the Mexican ones in recent years. Dubbed into Arabic, they are popular with audiences who follow the episodes, which sometimes run for months. The pun was not lost and the comment sparked a lot of reactions. @esraa_f_84: Let him watch. At the end of the day, he only has what is in front of him [his wife]. What will he do if he watches them? Will he travel to them or will they come out of the screen for him? Bulgarian newspaper Dnevnik reports [bg] that 25 asylum seekers (21 Syrians and four Iraqis) went on hunger strike to protest the slowness of the asylum-granting procedures at the detention center for foreigners in the Bulgarian village of Lyubimets. Comments to the Dnevnik article reflect the general indifference to the plight of refugees, as well as anti-immigrant and xenophobic attitudes. 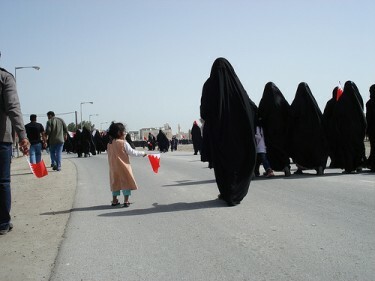 Blogger Maryam Monalisa Gharavi posts some photographs on her blog South/South for Iraq six months before the US invasion. Tunisian blogger Nawel Abdullah posts an interview [ar] she conducted with the founder of The Australian Society for the Palestinian-Iraqi Refugee Emergency Yousef Alreemawi, who speaks to her about the plight of Palestinian refugees living in Iraq and efforts to resettle some of them in Australia. I wanted to document the US troops stationed inside some of Saddam Hussein's old family palaces. There are 84 dotted around Iraq, but it was 2009, and the clock was ticking as soldiers were being withdrawn. You need media accreditation to get embedded with the US military and, although editors liked my idea, no one was willing to take responsibility for my safety. Eventually, the Yale Daily News agreed. It became a running joke among journalists in Iraq that I had a press card from my old college paper. I spent a month riding within the US war machine, going from base to base. At one point we stayed at an oil refinery, a picture of hell with an overwhelming stench of crude oil. There was a military dog (it actually held the rank of sergeant) who detested me and would chase me down, savagely biting my heels. The GIs laughed, saying he only attacked insurgents. We finally reached this palace in the Jebel Makhoul mountains to the north. It was used by Uday Hussein, Saddam's notorious eldest son. I was given just 14 minutes at the site. While setting up my camera for an initial shot of the palace foyer, I looked over my shoulder and noticed soldiers lounging around the empty, ruined pool. What I saw struck me as the long-lost hidden link between the 19th-century French painter Géricault and David Hockney. Without quite believing my eyes, I intuitively spun my camera around. The subjects had arranged themselves better than I could have imagined: the soldier to the right is spreading his arms like a figure in a classical painting. I had to put my tongue back in my mouth and remember to press the cable release. It's so rare to have that "decisive moment" – especially while using a large, wooden 8in x 10in format camera on a tripod in a warzone. A cloud even passed in front of the sun to soften the hard desert light. I took a single exposure, then a few more elsewhere, before I got barked at to pack up. The site overlooks the River Tigris: for me, there is something sinister and circular about an occupying army lounging around a toppled dictator's pool, in the area archaeologists call the "cradle of civilisation". Studied: English literature at King's College, fine art at Goldsmiths, London; photography at Yale School of Art, US. Influences: WG Sebald, Werner Herzog, Caspar David Friedrich, Thomas Struth. High point: Opening my show Infra, of shots of the Congo, in New York. Low point: The moments between projects. They're like jumping out of a plane without a parachute. Tip: Don't go to art school initially. Do a degree in something real like physics or music. Then you will have something to make art about. Tom Hurndall was a peace activist and an aspiring photojournalist. His photographs, alongside his journals, bear witness to the often terrible, sometimes uplifting, events he saw and experienced while living among families in Iraq, in a refugee camp in Jordan, and in the Gaza Strip. It was there on 11 April 2003 that he was shot in the head by an Israeli soldier while attempting to rescue a child who had been pinned down by gunfire. He died nine months later in hospital in London. He was 22. It is difficult, then, to look dispassionately at the photographs in The Only House Left Standing: The Middle East Journals of Tom Hurndall, which is published by Trolley Books this week. They are a mixture of reportage and citizen journalism of the most intense kind; a visual record of struggle and conflict left by someone who comes across as extraordinarily committed and fearless. As his writings show, though, Hurndall grappled with his fear every day. He travelled to Baghdad in 2003, one of a group of "human shields" who arrived just before the invasion by American and British troops, determined to protest the war in the most direct and dangerous way. In a series of articles emailed to Manchester Metropolitan University's student magazine, Pulp, he wrote honestly and without self-pity about his constant doubts and creeping fears. One sentence stands out: "When a man must lie to himself to do what he knows he should, that is when you know he is terrified." It is hard to equate these words, this kind of self-knowledge, with the handsome, short-haired, unshaven young man who smiles out from the first photograph in the book, cigarette in hand. He looks like a student about to begin a gap year, having just landed in some faraway country where adventure awaits. Like the emails and articles that punctuate the book, the photographs grow in intensity as his journey becomes ever more difficult, ever more dangerous. He took photographs inside a power station in Baghdad, on the streets of Amman, and in the Al-Rweished refugee camp just five kilometres from the Iraq border. He had an eye for light and shadow, for the snatched portrait, and for capturing a mood, whether joyful or sombre. By April 2003, he had arrived in Israel and, as the veteran Middle East correspondent Robert Fisk writes in his foreword, was heading "inexorably towards Gaza where he was confronted by the massive tragedy of the Palestinians". In Jerusalem, on 3 April, he wrote of the death of Rachel Corrie, who had been crushed to death by an Israeli defence force bulldozer while acting as a human shield near the Rafah refugee camp. "I wonder how few or many people heard it on the news and just counted it as another death, just another number … "
In the final section of the book, Rafah, Gaza, 06-11 April 2003, there is a series of Hurndall's photographs from the frontline of the protests against the Israeli tanks and D-9 bulldozers demolishing Palestinian houses. They are both dramatic and oddly intimate, a view from the ground of dirt and destruction, chaos and violence as well as the strange sense of calm determination that comes from the civilians in bright orange jackets who line up before these massive and intimidating machines. In his journal, Hurndall describes that day's events: "It was strange. As we approached, and the guns were firing, it sent shivers down my spine, but nothing more than that." The entry ends: "Any one of us could be watched through a sniper's sights at this moment. The certainty is that they are watching, and it is on the decision of any one Israeli soldier or settler that my life depends …"
The last picture that Hurndall took was a black-and-white shot of a street in Rafah at 1.30pm on 11 April 2003: a burnt-out car in the foreground, two children in the middle distance. The final picture in the book was taken by someone else. It shows him being carried unconscious by two local youths, both of whom are shouting for help. To the left, another youth is clutching his head in horror and despair. What looks like a camera bag is hanging from Hurndall's waist. Beneath it, the dusty street is stained with blood. In the frantic few minutes before this picture was taken, according to a first-hand account by the local co-ordinator of the International Solidarity Movement, Hurndall had rescued a young boy "trapped under fire behind a sand mound". Having carried the boy to safety, he went back to the same spot to rescue a young girl and, "as he was attempting to carry her, he got hit in the forehead by an Israeli sniper bullet". Hurndall's journals, as Fisk puts it, "show a remarkable man of remarkable principle". His photographs, too, are testament to the strength of his commitment to the cause of non-violent protest, and to his courage. He caught the world around him in all its uncertainty and, as it grew more dangerous and threatening, his eye grew keener. The images he produced became, by turns, more unflinching and reflective. They tell their own story of a brief life lived to the full. To celebrate the publication of a photobook called Lyrics of Love, the first solo show of the work of the great Lithuanian photographer, Algirdas Šeškus, runs at London's White Space Gallery from 1-10 March. The exhibition brings together some of his iconic images from the 1970s. His style is impressionistic and centres on the everyday in keeping with his idea that photography should remain true to its origins. Lyrics of Love is a break with his more recognisable work, and presents often-romantic glimpses of a country that is part-real, part a product of his rich, visual imagination. A long overdue acknowledgment of a photographic pioneer. A group of Kurdish Internet activists that have been organizing around the #TwitterKurds hashtag on Twitter have come together for the first Kurdish Social Media Gathering earlier this month in London. The event, which was followed through the #KSMG [Kurdish Social Media Gathering] tag, was live streamed and joined in via Skype and YouTube by those who could not be there physically, although there were participants who had traveled from as far as Australia to participate. It was held on January 21. 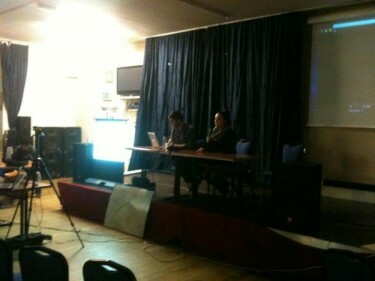 Others who were not physically there joined in the conversation with how they use the #TwitterKurds tag to communicate. @xoshink: Social media connected me to amazing people around the globe; helped me find Kurds locally with ambitions to make a change. @Vexhevxwaz: I totally agree with @apogeeculture1.#TwitterKurds inspired me to organize actions in my local Kurdish community. Participants focused on social media strategies, Twitter in particular, to attract attention to a given news story, as well as carry out a campaign. @Shakawan: Q: where do we go from here ? should trending kurdish issues be the top priority? @B9AcE: Need new, high impact topic. Send it to large noise makers, asking for it to be spread starting at same time. This gathering to me is one of the most important events of 2012. I work for Halkevi, the social media part at @halkevimedia, so social media is very important to me. I think we have been lacking in the social media area for quite a while and our numbers are not maximized, there are more Kurds on the internet but they are using it more for their personal stuff, but (social media can also be used) to create awareness and consciousness of Kurdish issues and democratic struggle of Kurdish people and people in the region. I want to talk about the importance of social media in diplomacy - we need to increase the social media effect in diplomatic spheres. We need to determine the agenda rather than having our agenda formed by outside events, such as arrests, operations, etc. We need to have our agenda and initiate to lead rather than be led by political developments that constantly change. Also, we constantly tweet the same thing, it's not getting outside. We need to target certain individuals, for example Middle East correspondents of every single international media organization and MPs. Social media needs to be not separate from grassroots, there are 200,000 Kurds in this country, we needed to have more people here. We need to use different strategies to engage them. Participants elaborated more on reaching out to professional journalists during breaking news events. @kurdishblogger: in order to attract the attention of international media, it is extremely important to have a photo, video or witness who can testify. Say, a BBC journalist needs at least 2 witnesses. They don't have that much time, you have to help them. You need to have a photo and you need to give context. People post photos on facebook without any explanation, I am Kurdish and I might know but you can't expect an international journalist to know (what the context is). @PerwinBerdizi: #KSMG#TwitterKurds unfortunately today's journalism is about copy+paste therefore, do half of their job and contribute with throughout news! 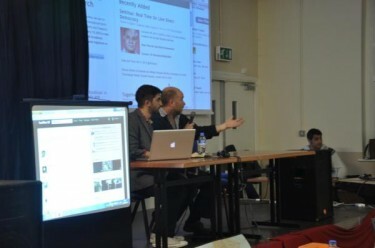 Tweeps deemed the gathering an overall success, with many people asking if there will be similar events in the future. More reactions are available on this Storify compilation by Nigar Hacizade.